For as long as I can remember, my biggest fear has been lightning. If I was ever outdoors with even the threat of a storm on the horizon, I would tense up and figure out how, where, and when I would be able to get inside. I knew how to tell how far away a strike was, and which indoor and outdoor locations are the safest hideouts in case of an emergency. Needless to say, a deep-rooted fear of lightning and five summers in the Colorado Rocky Mountains set me up for some interesting situations. Fast forward to the first time I ever lead a backpacking masa (backcountry excursion). 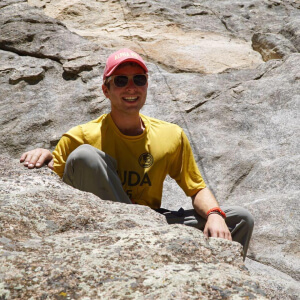 Though I had participated in numerous masa’ot throughout my time as a camper at Ramah in the Rockies, I still felt as nervous as I did excited, stepping into this new leadership role for the first time. I spent the next few days exploring Colorado’s Lost Creek Wilderness with a group of 13 and 14 year old chalutzim (campers). Everything was going according to plan until, suddenly, it wasn’t. The clouds overhead still looked light – far from the ominous dark gray of the typical Colorado thunderheads – and yet the thunder roared before I could even take a breath. The calm, pale sky had misled us, urging us to push onward toward the top of the saddle we had to pass, and now the lightning was much too close for comfort. If it had been five years earlier I would have been shaking in my hiking boots, closing my eyes, and hauling tuchus down the mountain towards safety. Even as an adult, I felt the familiar childhood terror creep into my mind. This time, however, I knew that I couldn’t let fear stand in the way of being the leader my campers needed me to be. I looked at the faces of those middle schoolers behind me, and in that moment, I realized that I couldn’t be the shaky, whimpering kid anymore. It was my turn to become one of the level-headed role models that I had looked up to and trusted to protect me during my masa’ot as a camper. I kept my cool, instructed everyone to turn around, and we quickly headed for lower ground. We found a small grove of aspen trees, all of which were evenly sized but weren’t the tallest trees in the vicinity I knew this would be the safest place to wait out the lightning storm; we had gone over lighting protocal time and time again during staff week and throughout the Wilderness First Responder training course that masa leaders participate in. Together we sat down on our backpacks and assumed “lightning position,” watching the flashes of the lightning, listening for the crashes of the thunder, counting the seconds between them all, and waiting patiently for the storm to pass. From that point forward the trip went smoothly, and the lighting storm became just another story for my campers to eagerly share with their friends when we returned triumphantly to base camp just in time for Shabbat that Friday. But for me, the memory of that storm is so much more than just another exciting masa story. In that moment, crouching in the aspen grove with those kids, I suddenly understood that the counselors I had looked up to as a chalutz all those summer ago were not super-human. They were ordinary people – people just like me – who rose to the occasion because they knew their campers were depending on them. This is what makes masa’ot at Ramah in the Rockies so special – for both the chalutzim and for their counselors. On these excursions into the unknown, we all have the opportunity to face our fears, overcome challenges, and emerge on the other side knowing that we are capable of more than we ever imagined.